This article is from the Sheridan Sun and is by Christina Janssens. The original article can be found here. There was a whale on the beach. For many people, encountering this scene in a dream could be forgettable. 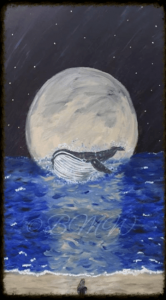 For Bobbi M. Wright, it was a sign that became the catalyst for her new children’s book The Princess and the Whale. “I’m somewhat of a believer that your dreams are trying to tell you something,” said Wright. The dream was so vivid that it stuck with her. “The only way to get it out of my head was to paint it,” she said. So, in 2015, she created a visual representation of the dream. To create the book, though, the story needed an illustrator. Enter Yasmin Pehlvi, a student in the joint Digital Enterprise Management program between Sheridan and the University of Toronto Mississauga. The publishing journey was a learning curve for both. Wright described it as “a crash course in business,” while Pehlvi said she had to learn balance between work, school and illustrating the book. However, the final product was worth it. Their advice for other creatives getting started in their field?